Love this idea- she takes pics of the kids the first week of school and prints out several copies of each (using either a printer or the super-cheap photo deals that come around for pennies per print), and viola! She said that each rule becomes that child's rule and they never ever forget it! 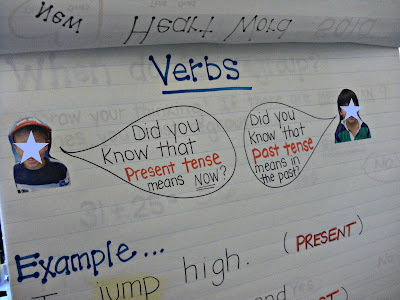 PS- We use Daily Language Instruction at our school to teach proofreading and conventions and really like it! 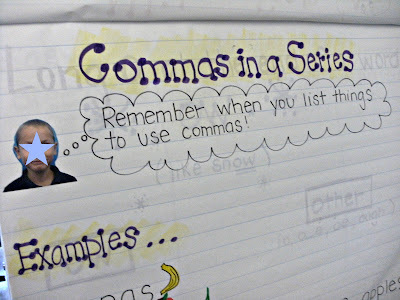 Love the pictures on your anchor charts! Anything that involves students' pictures get them 10 times as excited about it! What a fun idea! My kids love looking at themselves! haha! Just pinned this idea so that I will remember it! Thanks for this cute idea. It is a good way to let them learn the things. In traditional process a student can not be attracted towards this. I appreciate this. I am still poor in spellings and grammar. I have to use Dicfixers Business Proofreading services to get my offers letters proofread. I am thankful of them for this.